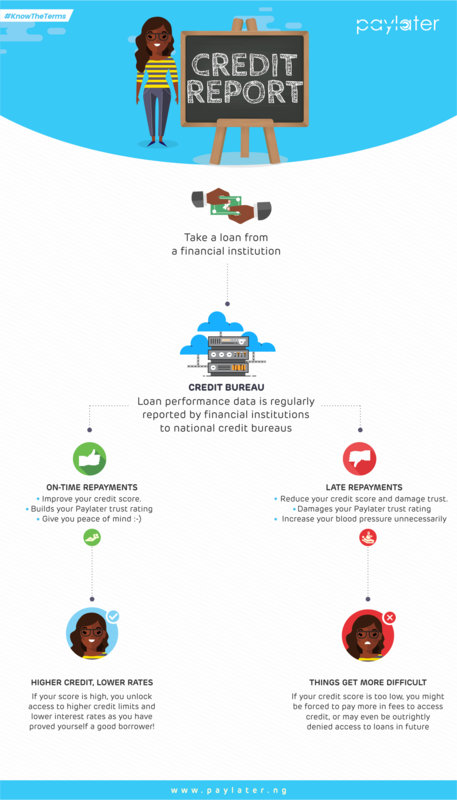 Loans — as with finance, in general — can do wonderful things for you when properly managed. It can help solve urgent problems, cater to substantial expenses and grow businesses. However, when mismanaged, credit quickly becomes a source of frustration and can cause real damage to your future financial prospects. Realize there is such a thing as ‘too much credit’. Taking on multiple loans at a time increase the risk of missing a payment and then getting stuck in nasty cycles of debt — constantly taking additional loans to pay off previous loans which you’re already struggling to service. A loan is a serious obligation and should be treated as such — it probably shouldn’t be used to impress your boys at the club! Assess your needs prior to applying — is the cash need important enough to take out a short term loan? If you don’t know what this is — you’re not alone! A lot of our new users start off unaware of the meaning of credit reports or the existence of the credit bureaus that store information on them. Financial institutions are required to provide these bureaus with data on the accounts you hold with them — this applies to current accounts, overdrafts, loans, and soon, even payments such as PHCN bills will be reported! Let us help you get better at managing credit — get in touch with us today or download the Paylater app on the Google Play Store. Serving the next billion, one click at a time. Download the Carbon app to get instant loans, invest money and make payments. Serving the next billion with digital financial services.